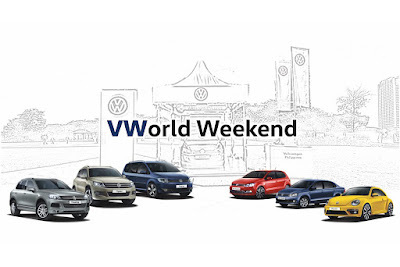 Families residing in or near Metro Manila can jump start their Christmas celebration by visiting Volkswagen’s VWorld Weekend on November 12 and 13 at Capitol Commons Park in Pasig City. There will be something for every member of the family at “VWorld Weekend,” as various attractions and treats await visitors. For parents and urban professionals on the lookout for their favorite Volkswagen vehicle, there will be cars on display and available for public test drives. The units will also come with special financing deals exclusive only during the “VWorld Weekend” event. The younger set can get their loads of fun at the popcorn and cotton candy stalls, face painting and glitter tattoo sections, and take souvenir photos. Hungry tummies can then go for a filling stop at the Kombi food truck to be stationed at the event venue. A “throwback” of sorts will be provided by the Volkswagen Club of the Philippines as it displays its vintage cars, while the Golf GTI Club of the Philippines brings out the eye candy with its own fleet. A set-up of Volkswagen Philippines’ award-winning road safety advocacy, the Child Safety Initiative (CSI), will also be featured to make the families’ visit not only fun, but educational and empowering, as well. The CSI booth highlights the Junior Driving Course where kids and their parents can learn responsible driving practices using miniature cars on a simulated road network with signs and traffic lights. The “VWorld Weekend” is open from 1 p.m. to 10 p.m. on November 12 and 13, 2016, and entrance is free. It is organized by Volkswagen Philippines’ Metro Manila dealerships, specifically in Bonifacio Global City in Taguig City, Quezon Avenue in Quezon City, Greenfield District Service Center along Sheridan Street in Mandaluyong City, and in Molito Lifestyle Building in Alabang, Muntinlupa City. Collectively, they are known as the Iconic Dealership, Inc. The “VWorld Weekend” aims to bring the experience of world-class German automotive engineering and multi-generation bond between Volkswagen and the Philippines---closer to families in Metro Manila during the Yuletide season. Unless VW will offer a car below Php 1m on the Filipino buyers dining table, its business in the philippines will never grow. Most of it's car designs are obsolete and nothing head turning or special. Its true the 'Beetle' is good but the price makes it a bad choice. They already offer one. The Polo Hatchback 1.6 Comfortline is Php950k SRP. Oh im sorry, checked the website and you are right. But with the Polos's very common and dull design, the Mirage looks even sharper. It would be nicer and more fun if another compact crossover around that is available on their line up. ..i mean around that price (below 1m). In that case, VW might get a share, small it might be. VW is placing their brand as a premium alternative to the usual Asian and American brands. Nothing wrong with that but it does hamper the attainability of their cars. Not to mention the brand's previous distributor left a bitter taste to their patrons. Reliability and servicing poses as a problem for VW as well. Volkswagen PH seems to position their brand as premium but if you look at the specs, features and equipment, design, and price of their offerings and compare it to their Japanese competitors. Japs win in every aspect. Their current pricing is okay but the features and equipment are not.